Acupuncture is the insertion of small, thin, sterile needles into specific points of the body to cause a desired healing effect. This technique has been employed in Eastern Medicine for over 3,000 years in the treatment of many different ailments. Used either by itself or in conjunction with Western Medicine, veterinary acupuncture can assist the body to heal itself by effecting certain physiologic changes. Like people, cats and dogs have key acupuncture points in their bodies. It is effective for musculoskeletal problems such as arthritis and degenerative joint disease, neurological disorders such as seizures, skin conditions, GI disorders, and many other chronic conditions. In addition, acupuncture can greatly increase overall vitality and energy, thus improving quality of life. There are several different methods of delivering acupuncture, which is right for my pet? At your initial consultation, your veterinarian will discuss which method is best for your pet and their conditions. Below are all the methods that the Animal Therapy Center currently offers. 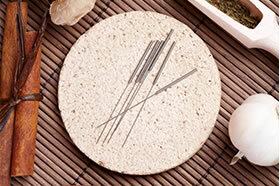 Dry needle acupuncture: This is the most common treatment method. Small, thin needles are inserted by your acupuncturist. These needles typically stay in for an average of 20 minutes. You can sit and relax with your pet while they are receiving their treatment. Aquapuncture: Is a injection of a sterile saline or vitamin B12 into the acupuncture points to lengthen and strengthen an acupuncture treatment. This can be can used in conjunction with traditional dry needle acupuncture or as a stand alone therapy. Electroacupuncture: Is a gentle stimulation of acupuncture points using an electro-stimulation unit. This unit sends an electrical current through the acupuncture needles that have already been inserted into the points. This method allows the acupuncturist to deliver a higher and more continuous level of needle stimulation. How long are canine and feline acupuncture treatments? No matter what method of acupuncture you are receiving expect to be in our office for 30 minutes. Both cats and dogs experience the same length of treatment times which can vary from 15-25 minutes. Our veterinarians individualize treatments and discuss the best course of action at each appointment. Will my dog or cat experience pain during their acupuncture treatments? The Animal Therapy Center strives to keep your pet's experience positive. Dogs are given a comfortable orthopedic bed to lie on and cats a comfortable padded surface higher off the ground. Most pets relax and find acupuncture to be a painless experience. Most pets feel a tiny prick when needles are inserted, and sometimes a duller sensation when the needles hit the acupuncture points. Your pet does remain awake during treatments and no anesthesia or sedatives are needed. All owners are welcome to stay in the room with their pets while they receive treatments.